Are you and your kids getting ready for The Big Game? Do your children love to play sports like football? If so, they are sure to enjoy reading Let’s Play Football which was written by Jon M. Richter. This exciting children’s picture book features the Bears versus the Lions in an action packed sports story. It is the 1st book in a planned series which was created by two dad coaches. Our family enjoys watching sports together so I knew that my sons would really like this book and they definitely did. What makes this book so unique is that it works along with a limited time free app from iTunes. Geared towards children ages 3 to 6 this book and app introduces them to the fundamentals of the game of football, sportsmanship and teamwork. Let’s Play Football features a young bear cub and his dad who are passionate about their favorite football team, the Bears. The delightful bear duo heads to training camp and ultimately goes to game day when the young cub can practice remembering what he learned about the rules of the game and the culture of football. While our 8 year old son will watch football games on television with us he doesn’t fully understand the basic rules so this is a perfect introduction to the game in a way he can understand. My husband read this book to my boys (while I listened) and we thought it ingenious that it features real players’ names and football personalities such as Ron Jaworski (a pro ESPN football announcer) who narrates this story and Merrill Reese who is the radio voice for the Philadelphia Eagles and does the play-by-play announcements in this story. My six year old son who is learning to read liked this book so much that he practiced reading it by himself making it a great way to encourage a young learner to read. We really liked the colorful, fun illustrations by Joseph W. Krzemienski that brings this story to life and the colorful cast of characters is lots of fun to watch in action. Young sports fans are sure to enjoy this children’s book and especially the free app that goes along with it. This would be a wonderful gift idea for a child who is learning to play football or to have on hand for the kids at The Big Game parties and tailgating events. 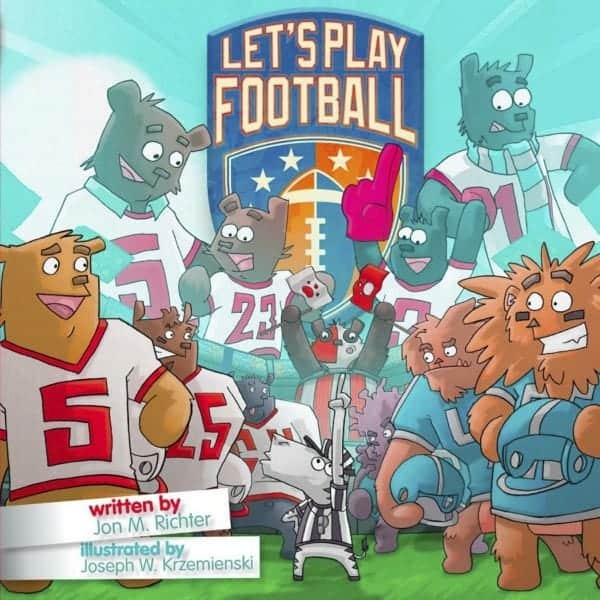 The Let’s Play Football hardcover picture book (SRP $13.99) is available for purchase at Amazon.com and at Let’sPlay-Football.com. The Let’s Play Football app is included for FREE for a limited time only too and you can download it at iTunes!